Misal pav is a popular Maharastrian dish. 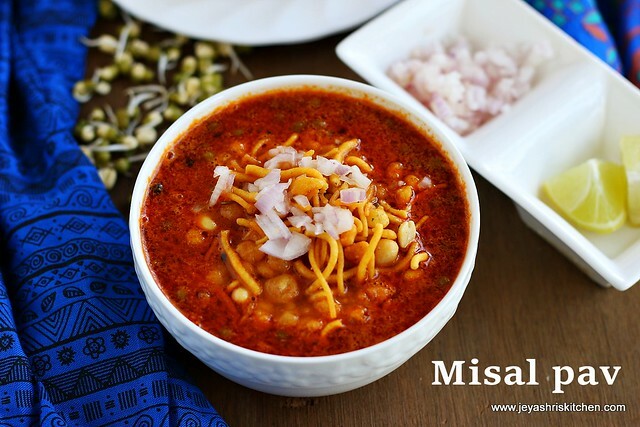 Misal is a gravy made using sprouted moong bean. Traditionaly they use moth beans but i used Green moong sprouts. It is served with pav buns, garnished with chivda and chopped onions. I have heard about this a lot but never tasted or tried anywhere. As have sprouts, bun and chivda too at home, thought will try the misal pav today. My friend gave me the recipe and explained it in detail. 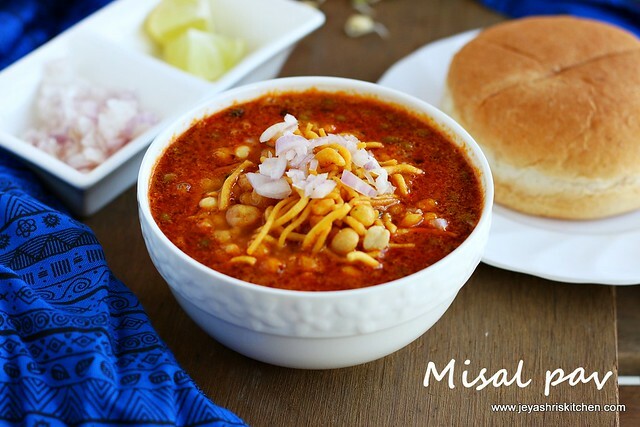 Though there are many variations in making this misal pav recipe, here i am sharing you the recipe which i got from my friend. It turned out very well and i loved it very much. A very healthy recipe and a must try one too. Even this misal can be served with rotis too. In a pan add 1 tsp of oil and throw in the ingredients given under"to grind". Saute them in a low flame for 3-4 minutes. Allow this to cool and grind this into a fine paste. You can add little water while grinding if needed. In a pan add the remaining oil and add the cumin seeds, black pepper, bay leaf and cloves. Finely chop the onion and tomato. Add the onion to the oil nad after a minute add in the tomatoes. Add in the corinader powder. Now add in the ground paste to this. Cook this nicely in a low flame till the oil oozes out. Add in the goda masala(if adding), turmeric powder and salt.This gives an fantastic flavour to the misal gravy. If you do not have this goda masala, skip this step. Add in the sprouts now. Add 2 cups of water to this and bring it to a nice boil for 5 minutes. the gravy will be slightly thin only. Add the sugar and switch off the flame. Squeeze in the lemon juice. 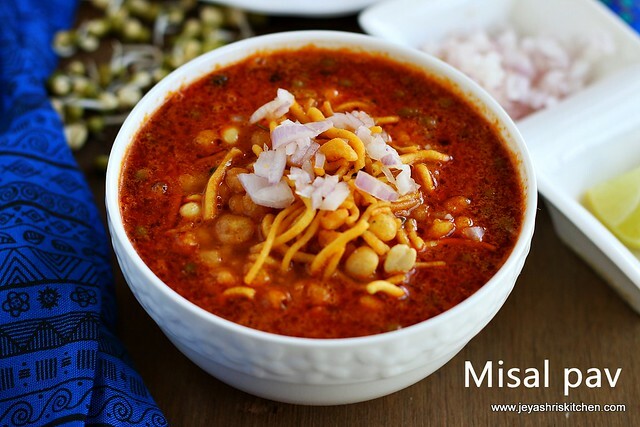 To serve, pour the misal gravy in a bowl and garnish this with farsan| chivda|mixture. and finally garnish with finely chopped onions. Generally the pav buns are not toasted for this as we do fro pav bhaji. But if you want you can toast it. Serve this hot. Since it is spicy they generally serve this with a glass of buttermilk. The gravy will be slightly thin only. You can add fresh coconut if you do not have access for dry coconut. I just love it .. specially the hot Kolhapuri version .. Super delicious !